As common in rest of Malaysia, most people are either Chinese, Malay or Indian. There is even a population of Portuguese origin, descendants of colonists from the 16th and 17th centuries. Similarly, there are a number of Sikhs residing in Malacca. Together they practise mainly Islam, Buddhism, Hinduism and Christianity. Malacca is also known to be a centre of Peranakan population [Chinese settlers who married local Malays]. 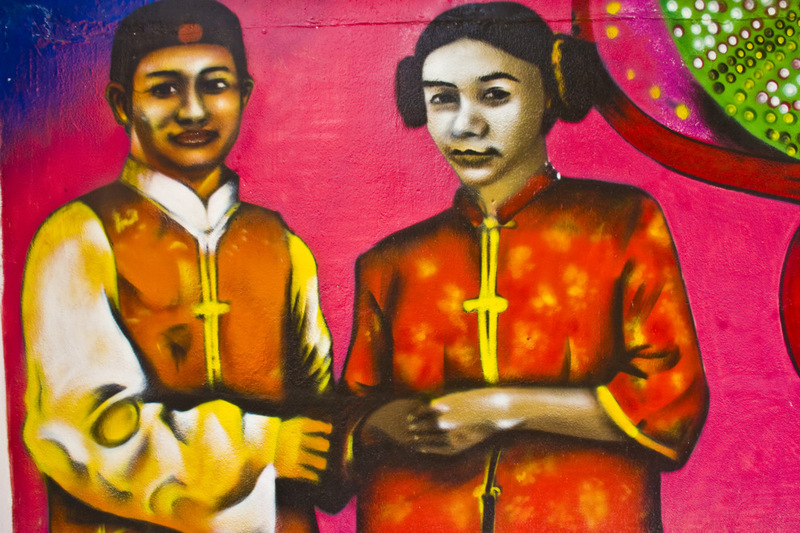 These Straits Chinese are referred to as 'Baba Nonya'; Baba for males and Nonya for females. Interesting that these portraits appear to be a mixture of different races to me. These murals are amazing Ayush, what was this on? I'm enjoying your mural captures. That is a very nice painting. A real melting pot of people Ayush. I am impressed with the quality of these murals. These are fascinating. I like the strong colours. You paint a picture of peace and harmony. Very interesting. This is a nice choice for the picture Ayush. Wonderful strong colours here Ayush! This is fun and educational, Ayush! In some African languages, Baba is a respectful handle when you speak to an older male. Another colourful mural. Lovely mural and very interesting information.